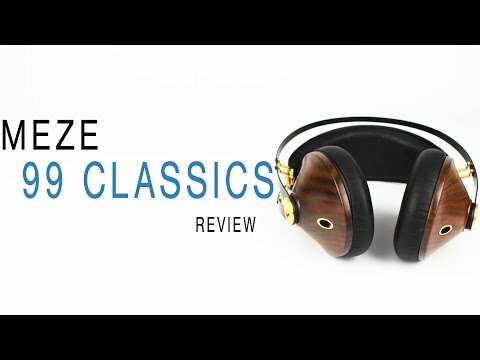 The Meze 99 Classics blew through their Indiegogo campaign a couple of months ago and now we get to take a look at them. So was it worth the wait? You get what you pay for, the Meze 99 Classics are a gorgeous pair of headphones with good sound to match. If you haven’t heard of Meze before don’t worry, they’re a relatively new company. They ran an insanely successful campaign on Indiegogo that ended in the Meze 99 Classics being funded 219% to goal. These headphones have a gorgeous design and the company claimed they provide “premium sound for those who know.” Well, we know. So are they worth the money or did all of the backers just blow their money? The box comes in black and gold with graphics on all four sides. The specs on one side, information about the headphones on the other, and a dark outline of the headphones on the front and the other side. In the box you’ll get a black hardshell carrying, the headphones, a small pouch with two audio cables, a 1/4″ adapter, airplane adapter, and of course the warranty information and instruction booklet. These are made with a lot of metal and wood, which would make you think that they’re heavy, but you’d be wrong. They feel lightweight in the hand but you really notice how light they are when you put them on your head. The metal bars up top fit nicely but it’s the self-adjusting headband that does all the work, allowing the headphones to fit snugly without being too tight. That kind of form fitting is also reflected in the padding on the ear cups which sit almost flat on the ears but still allow them room to breathe. These aren’t as comfortable as something like Bose, but it’s a close second and that’s saying something. Design wise, these are a very pretty pair of headphones. The black metal is accented with lots of gold and of course the dark wood of the ear cups. The connecting joints on the skeleton of the headphones is the only place where you’ll find the Meze branding, nice and small just how we like it. The 3.5mm inputs on the bottom of each ear cup is also accented in gold and serves a purpose, besides looking good that is. The audio cable needs to be inserted into the bottom of each ear cup separately. The gold circles around the inputs help you locate them easily and you’ll be happy for them if you’re trying to do this in the dark. These look like they could be easily crushed by a book or a hard drop but that’s not the case. We definitely didn’t drop a book on them, but they survived a full backpack without a problem and the thin metal is actually pretty hard to bend or break. Another plus for Meze is that they claim to have designed them to last and not “just to break after 2 years”, so they come with a endless warranty. As long as you own them, Meze will take care of you. We’re looking at the gold version, but they also come in a silver model with a lighter colored wood on the ear cups. As previously mentioned, these require you to plug into each ear cup separately. Luckily it’s a pretty secure fit, and the cable didn’t go flying out whenever it got snagged on something. These aren’t Bluetooth so if you’re looking for a wireless option you’ll have to look somewhere else. That said, we’re pretty happy that they’re not wireless. Adding all the extra Bluetooth components would definitely make the headphones a lot larger and therefore heavier. The Meze 99 Classics Gold come with two different audio cables: one 3m cable for use in a studio setting or at a desk, and one for use with portable devices. The first cable is strictly for listening so you won’t find any playback controls or anything like that, but the latter come with fully compatible playback controls about an inch or two down from the left ear cup. Fully compatible meaning that it doesn’t matter whether you’re using an Android or iOS device as your source, controls still function the same. Unfortunately, the only way to achieve this is to get rid of the volume controls so if you want to adjust that aspect of the sound be prepared to reach for your phone still. Another thing that wasn’t entirely easy to get used to is the location of the control module. It’s located further up on the audio cable then I’m used to so there was always a good amount of fumbling trying to find it. Pressing it once pauses and plays music as well as answers phone calls, while double tapping skips songs, and triple tapping starts the song over or goes back to a previous song. You can also hold it down to access Siri or Google search. Since these come with two wires for two different kinds of listening situations, we did our testing accordingly. Half the time testing these was used while commuting and the other half was spent with them plugged into a Scarlett 2i2 audio interface at a desk. Regardless of the scenario, these sounded good. The lows on the Classics were close to perfect for me. They’re not super strong at all, sorry bass-heads. But they do have a very accurate sound. You’ll notice its presence but it won’t be the dominating feature of the songs you listen to. In the song ‘Girls’ by Slow Magic the bass kicks throughout sound great, adding to the energy of the song without messing anything up in the other frequencies. The mids sound decent but they had to be the weakest part of the headphones if that makes any sense. Most songs sounded a little muddy in the mids and though vocals were given prominence some lower mids tended to get mashed together. This can be heard in the song ’Run Wild’ by Jon Bellion. Nothing sounds bad really, but some things get a little lost. The highs do have a bit of harshness to them which does force you to lower the volume a click or two but it’s nothing unbearable. The whistle melody in ‘Young Folks’ by Peter Bjorn and John has a lot of detail to it but can definitely be a little uncomfortable at times. That said, the shakers and hi-hats throughout the song sound fine. The Maze 99 Classics Gold aren’t perfect, but they just barely miss the mark. They have a great design and though they look otherwise, they’re fairly durable as well. One thing to be careful of is accidentally scratching the metal up top against something like a wall. I accidentally did that with nothing playing and the sound was amplified in the headphones, not fun. Besides that the sound is good but could use a couple fixes here and there, but is really good as well. If you’re looking for amazing with great accuracy you’re better off with something like the M70X by Audio-Technica, but if you want a really good looking pair of headphones with sound to match, we have no problem recommending the Classics Gold 99.